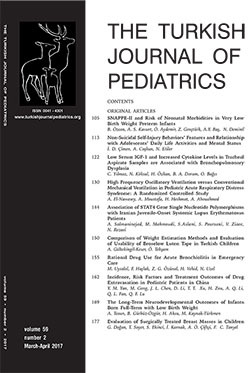 1 Department of Pediatric Surgery, Hacettepe University Faculty of Medicine, Ankara, Turkey DOI : 10.24953/turkjped.2017.02.010 Doğan G, Soyer T, Ekinci S, Karnak İ, Çiftçi AÖ, Tanyel FC. Evaluation of surgically treated breast masses in children. Turk J Pediatr 2017; 59: 177-183.